ANOTHER year on, another FA Cup run over. Or at least that’s the case for a few more non-league clubs this week, including my near-neighbours AFC Fylde, after their exit to fellow Lancashire outfit Accrington Stanley on Saturday. No disrepect to the mighty Atherton LR there, even if Glenn Moses’ side aren’t even the biggest side in Atherton at present, judging by this year’s North West Counties League table. That particular honour falls to neighbours and fellow NWCL second flight side Atherton Collieries. It’s been a few years since I graced Crilly Park (for an early FA Cup qualifier against Bamber Bridge in the mid-90s, I vaguely recall – another rock’n’roll moment in my less-than-illustrious era as a sports reporter). But this week’s county cup fixture is unlikely to worry the BBC, ESPN and Sky Sports production teams. Yet that at least gives the club time to dwell on all that’s gone on these past few weeks amid a highly-contagious bout of cup fever at their base in Warton, not far from Preston, better known for its low-flying jets from the nearest British Aerospace plant. And the Coasters will have to be firing again by Saturday for sure, when they face an FA Trophy third qualifying round trip to the West Midlands to face Solihull Moors. Again, no offence to the mighty Moors, who are a stage higher than their Lancashire visitors, even if they are currently languishing in the wrong half of the Conference North. The name itself suggests a touch of spice to be honest – the sort our rulers would have waged war upon in the dark old days of the Crusades. But – sorry to burst your bubble – it’s really just a club borne out of a financially-astute amalgamation of the former Moor Green and Solihull Borough clubs. Either way, Fylde’s trip to the south of Birmingham and the tasty-sounding Damson Park, Solihull, is a potentially mouth-watering tie for the Coasters, and could in the long run be every bit as important as last Saturday’s FA Cup epic. Yet somehow I don’t think it will attract the same level of interest. Fylde went through a whole heap of excitement last week as the camera crews followed them around, including features on BBC One Breakfast and North West Tonight. The cameras were down at the club’s training session at Preston College and there were interviews with Challinor (including the inevitable chat about his prowess with the long throw at Tranmere Rovers), Glen Steel and ex-Manchester United star in the making Michael Barnes, whom ITV filmed in his role as a tree surgeon, while Chally and club president Dai Davis also held court on BBC Radio Lancashire in a live studio preview. As it was, there was no shock result though, and the national bandwagon instead moved on to Dorchester Town, their defeat of Plymouth Argyle the most eye-catching result to come out of the weekend’s FA Cup first round results. But – irrespective of Saturday’s outcome in Solihull – I guess it’s the Evo-Stik League top flight where the club’s real focus should lay this season. The Coasters are currently nicely placed, in 10th place in the NPL Premier Division, with enough games in hand to make a real assault for a place in the Conference North next term. However, it doesn’t hide the fact (warning: cliches ahead – don’t read on if easily offended by lazy football phraseology) that we’re down to bread and butter rather than jam again, and there can be few worse lines to hear in football than those tired old quotes about it being time to ‘concentrate on the league’. Let’s face it, the days are getting shorter, the first frosts have already arrived, and the lure of all that terrestrial and satellite TV coverage is surely behind us for another year. 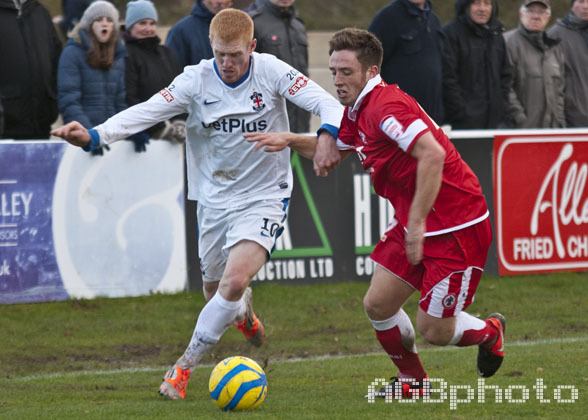 There were probably a lot of people on Saturday at Kellamergh Park who had to be reminded who was who and which way the hosts were kicking, a few perhaps on their first visit since that big trip to Wembley and victory over Lowestoft Town in the FA Vase final of 2008. I’d like to think a few of those fans will visit again, and enjoyed their big day, but you just get the feeling that it will be down to the club faithful from herein as the Coasters look to keep their season on track as winter wends in Warton. Let’s not be morose though. Surely there’s a fair few quid in the Coasters’ coffers after the FA Cup run, and the club’s rise through the ranks continues – those West Lancashire League clashes with the likes of Slyne-with-Hest and Tempest United long behind them. No offence to clubs at that level either – I spent some enjoyable times reporting on matches at Charnock Richard, Coppull United and Euxton Villa. And that (further warning: more cliches and mixed metaphors to follow) unpredictable roller-coaster of highs and lows is surely what it’s all about. You’ve got to take the crunchy with the smooth, and the less remarkable games make the more climactic moments all the more sweet. 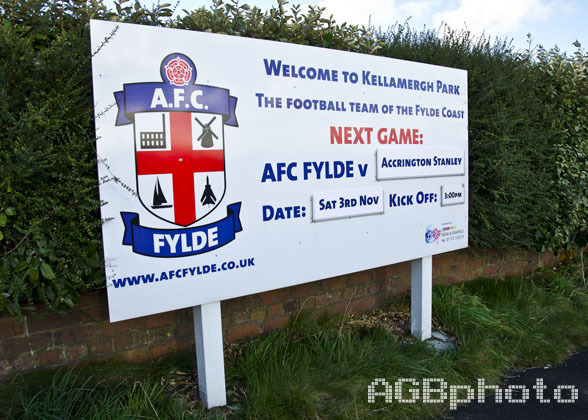 So well done, AFC Fylde. The cameras have gone for now, but the dream remains. And there’s always next season. * You’ll be pleased to know there was no FA Cup hangover for Chally’s boys, who brushed aside Atherton LR 6-2 in their county cup tie the following Tuesday night. This Malcolm Wyatt article, in an earlier form, first appeared on the http://www.sportnw.co.uk website on November 5, 2012. This entry was posted in Football, sport and tagged Accrington Stanley, AFC Fylde, Atherton Laburnum Rovers, Dave Challinor, Dorchester Town, Evo-Stik League, FA Cup, Michael Barnes, Solihull Moors, Warton, West Lancashire League. Bookmark the permalink.